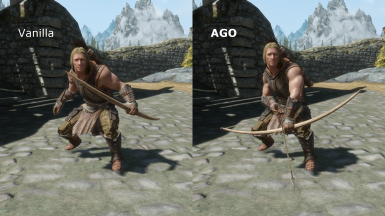 Adds many features and changes to bow gameplay. 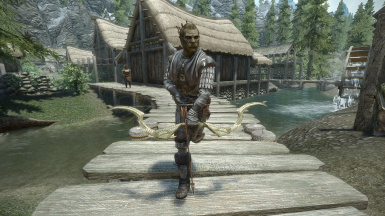 Includes new animations with nocked arrows, bleeding, persistent arrows, and arrow enchanting. RaceMenu Preset - Altia For the neat Bow animations. Please don't host these files elsewhere without my permission. Just leave a link to this page. You don't have to ask for permission if you're not hosting any files. 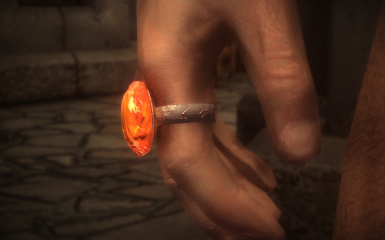 Enchant your arrows using spells or rare rings. 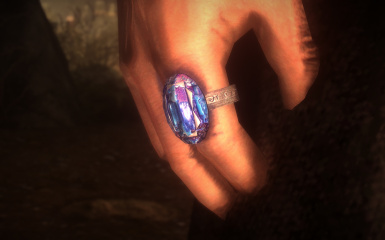 Any arrows (including modded & DLC) can be enchanted in the 4 basic types: fire, ice (frost), magic, and shock. The damage you'll do depends on your Enchanting skill, and can be set up in the MCM. 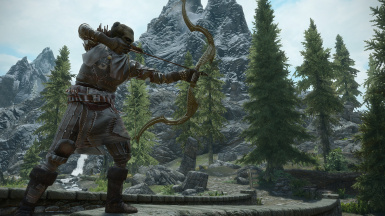 The enchantment will display FX on your quiver when your bow is sheathed, and FX on the arrow when your bow is out. The 'Enchant Arrow' spell tomes can be found at any destruction spell vendor (E.g. 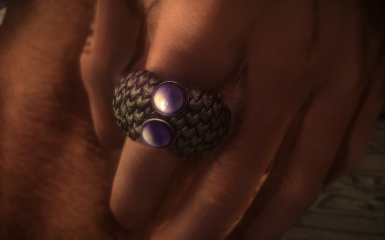 Farengar @ Dragonsreach, Faralda @ The College of Winterhold, etc.). The tomes are distributed through a script to avoid mod conflicts and to remove them from the game, if you choose. 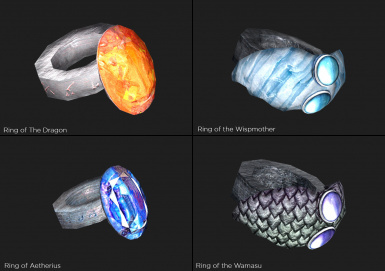 The 4 rings can be found on specific enemies: Dragon Priests (Ring of the Dragon - 100% Chance), Wispmothers (Ring of the Wispmother- 100% Chance), Mages (Ring of Aetherius - 10% Chance, Ring of the Wamasu - 10% Chance). The rings will automatically charge your arrows by depleting your magicka. If your magicka is too low, the arrow will not be charged; at least until you fire again or re-equip the ring. All arrows now inflict bleeding, a damage over time effect that lasts for 30 seconds. Bleeding doesn't kill, it stops dealing damage when the target is at 10% health. Bleeding damage scales with the target's level, so you'll see a consistent damage as you progress in the game. 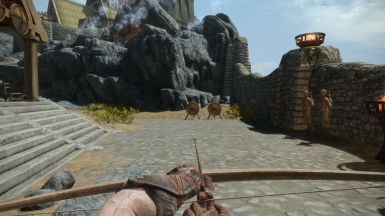 Arrows (and projectile spells) will remain stuck into their target indefinitely, and can be removed from yourself and NPCs using a new ability called 'Remove Projectiles'. With this ability, you can collect some of the arrows you've been shot with. If you like, you can set a hotkey in the MCM to quick-cast this abilty, removing the trouble of going through the menus. Typically, you'll have two options for your 3rd person camera: idle, and combat. 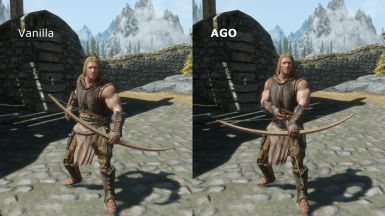 This mod introduces a third camera position that's used only for bows. When you unsheathe and sheathe your bows, you'll see the camera pan over to this third position (as seen in the belt-fastened quivers video). 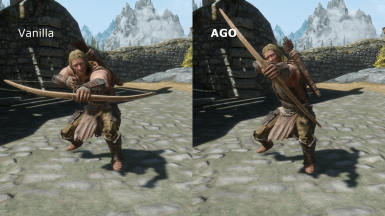 It's not just the camera that changes position when using a bow, the 3rd person crosshair will also move into position. With this system, you can set the camera wherever you like and still have an accurate crosshair. Both the camera and the crosshair have specific settings for sneaking, non-sneaking, and transition speed in the MCM. Holding your bow drawn really takes its toll. 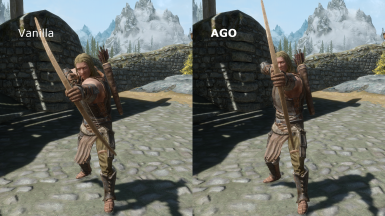 This mod adds a small shake to the camera and controller when your bow is drawn. After a while, your arms will start to shake more rapidly. Eventually, the shake will become very strong and your stamina will start to run out. The total drawn time scales with your Archery skill; you can see it in the MCM in the 'Statistics' tab. ABT - Arrows and Bolts Tweaks﻿ +50% Faster arrows is what I use. AGO should be used with this for best results. 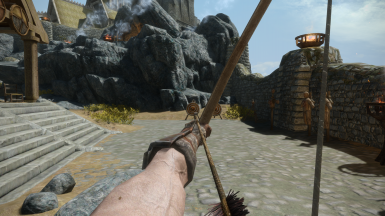 Skyrim Realistic Archery Bows and Arrows -- Game settings are overwritten, put AGO later in your load order. 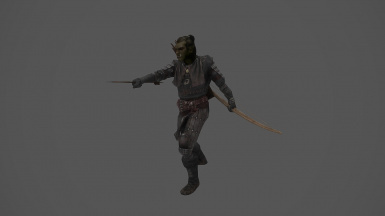 Nock to Tip -- (No SSE port) AGO overwrites bash animation. No other issues. 1. Download the Main File and Belt-Fastened Quivers Support, if you need it. 2. Install the Main File, and overwrite any conflicts (use a mod manager OR extract the files into your Data folder and activate the esp). 3. Install Belt-Fastened Quivers Support and overwrite any conflicts (including the main file). Generate FNIS for Users. Make sure you have the new "FNIS Behavior 7.4.5 SE add-on 2 (AGO)", you can get that from FNIS's nexus page. Install all of AGOs animation folders into a PCEA2 subfolder. The mod starts automatically when you run the game. 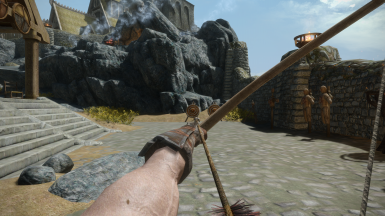 You'll see a notification telling you to re-equip your bow and arrows. If the MCM doesn't show up immediately, open and close the start menu a couple times and it will show up. 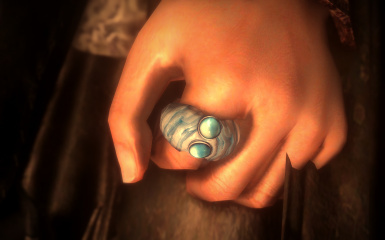 Mattiewagg - This mod includes a slightly modified version of Dangerous Spell Comments Removed. Thanks go out to her for letting me include it in this mod. LogicDragon - Creator of Skyrim - Enhanced Camera. Thanks for letting me include the INI with this mod, and for fixing Magic Effects. 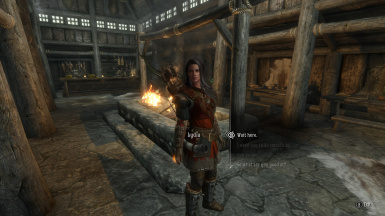 rxkx22 - Lydia's appearance is from their mod, Bjinn Warmaidens. CaBal120 & frankdema - Their mod, Wanderer Cuirass, was used in many of the screenshots. /u/davelikestacos - Playtesting the mod. 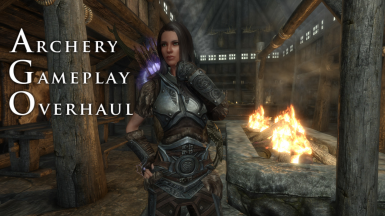 I also want to thanks everyone on /r/skyrimmods who contributed their ideas, comments, and support for this mod. The positivity coming from the community was a big motivator for me during the development of this mod.